Around - Benvenuti su poggiodisole! 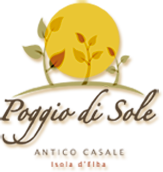 Round the Poggio di Sole there are rustic family run restaurants, organic farms, educational farms, small markets, public beaches and beaches with bathing establishments, water sports, and nature walks in the Tuscan Arcipelago National Park. There is no shortage of coffee shops for breakfast and bars for aperitifs. Wine cellars which produce an excellent elban wine and sport their precious Aleatico wine.